In association with Art from Milingimbi: taking memories back , this lecture series explores the art of Milingimbi with the curator and other scholars in the field. Cara Pinchbeck is the Gallery’s curator, Aboriginal and Torres Strait Islander art and curator of the exhibition Art from Milingimbi: taking memories back . The exhibition Art from Milingimbi is the result of a new collaborative partnership between the Gallery and the people at Milingimbi, through which we can better care for and understand this significant collection of art. Such an approach respects the ongoing rights Aboriginal communities have to their material culture and recognises that cultural authority over art does not diminish merely because a work has entered an institutional collection. Curator Cara Pinchbeck will reflect on the development of a reciprocal partnership that draws on the expertise of both parties for mutual benefit to realise this beautiful exhibition. Howard Morphy is distinguished professor of anthropology at the Australian National University in Canberra. Howard Morphy visited Milingimbi in 1973 in the company of the former superintendent the Reverend Edgar Wells. 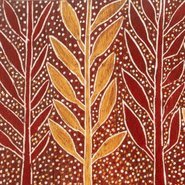 He was introduced to Binyinyuwuy and Djawa and there was a tangible feeling of warmth and sense of partnership between Wells and the artists. From the beginning of Yolngu encounters with the Methodist missionaries, art and material culture were a medium of exchange and a means of communication. The relationship between the Yolngu and the Church was a dynamic one that continues into the present. The lecture will explore the trajectory of Yolngu art over time, the changing motivations of Yolngu and missionaries and the profound consequences of their relationships on the recognition of Indigenous arts and rights. The relationship was one of mutual persuasion and the Church played an important role in widening people’s awareness of the beauty and value of Yolngu art. Rebecca Conway is curator, ethnography at the Macleay Museum, Sydney University Museums. The late Dr Joe Neparrnga Gumbula, following in the footsteps of his artist father, Tom Djawa, worked passionately and collaboratively with outsiders to promote an understanding of Yolngu culture. In 2006 Gumbula began working with the University to assess historic photographs from Arnhem Land in the University of Sydney Archives and Macleay Museum. These holdings include some of the earliest images of Yolŋu communities, taken by missionaries and anthropologists working in Milingimbi, eastern Arnhem Land in the mid-1920s. This talk explores the legacy and understandings gained through Gumbula’s work at the University, including his exhibition, Makarr-Garma: Aboriginal collections from a Yolŋu perspective (2010).